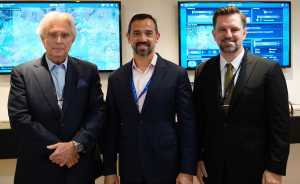 Hong Kong/ 8 August 2018 – Satcom Direct, the business aviation connectivity, software and hardware provider, has confirmed its first Jet ConneX installation for Deer Jet subsidiary, Hongkong Jet. The ultra-high-speed Ka-band service, powered by Inmarsat’s Global Xpress satellite constellation, is being supplied to a privately-owned Gulfstream G650ER, managed and maintained by Hongkong Jet. Photo Caption: Denzil White, CEO Hong Kong Jet, Nathan Andrews regional director SD APAC, Mike Walsh CCO Hongkong Jet. About Satcom Direct: Satcom Direct (SD) and its companies provide global connectivity solutions for business and general aviation, military, government, and head of state aircraft. The company also provides land mobile services to areas with connectivity limitations. Since 1997, SD has worked to advance the technology of global connectivity, being first to market with new capabilities in communications technology. SD’s industry leading hardware solutions, like the SDR, are complemented by their divisional capabilities including SD Avionics cabin and flight deck systems and SD software solutions. A premier Inmarsat distribution partner (including Jet ConneX), Iridium service partner, and ViaSat Ku preferred reseller, SD is also a value-added reseller for Panasonic systems and the exclusive service provider for SmartSky Networks.